As you can imagine for an outdoor mosquito control company, summer is a very busy time around our office. However, for one week each year we take some time to step back and really focus on the reason we do what we do: the importance of mosquito control and educating the public. This year National Mosquito Control Awareness Week (MCAW) was June 25-July 1. MCAW is a time to educate the general public about the significance of mosquitoes in daily life and the important services provided by mosquito control workers. Mosquito Control Awareness Week is close to our hearts here at Mosquito Joe for obvious reasons. Our franchisees spend a lot of time out in their local communities, spreading awareness of the importance of mosquito control and the services Mosquito Joe provides. Not only are these bugs a nuisance that can ruin your summer fun, but they pose serious health risks such as Zika, West Nile, and EEE. While we work all year long towards these efforts, a designated week such as this really shines the spotlight on professional mosquito control and why we need it. By far, the biggest part of the week, and the one we most look forward to, is giving back as a company. For the fifth year, Mosquito Joe locations across the country partnered with local blood donation centers for our Beat the Bloodsuckers campaign. For every new customer that signed up for mosquito control services during Mosquito Control Awareness Week, we donated 10% of the sale to those local blood banks. This year we also offered a new partnership with Nothing But Nets alongside our traditional local blood bank partnerships. Since 2006, Nothing But Nets has raised more than $45 million, delivering more than 7 million bed nets to protect families in Sub-Saharan Africa from malaria. A mosquito net sent to someone in need is $10, so for each new customer who signed up during Mosquito Control Awareness Week, we contributed $10 to represent a net. Our franchise owners were able to choose whether their philanthropic efforts that week went towards a local blood bank or to Nothing But Nets. This year we had the privilege of partnering with twenty two blood banks across the country. This money will go towards the amazing work these organizations do in saving lives and emergency assistance. Because of our amazing customers, we were also able to donate over $6,353 in just one week to the blood centers we partnered with. Franchisees who partnered with Nothing But Nets donated $13,774 to the organization, supplying 1,377 life-saving nets to those in need. We’re so grateful to everyone that made our 2017 Beat the Bloodsuckers campaign the best yet and a giant highlight for us as a company this year. Thanks to our participating franchisees, each blood bank that we partnered with, Nothing But Nets, and our AMAZING customers that helped make this year’s Beat the Bloodsuckers campaign the huge success that it was. Decorate a favor: Get small treasure chests from the local craft or dollar store and have kids decorate them as favors. Walk the plank: Set up a kiddie pool and lay a piece of wood across the top of the pool. 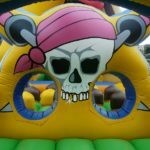 Have the kids walk the plank! Dig for treasure: If you have a shallow storage tub lying around, fill it with sand. Bury toys into the sand and let the kids dig for them! Keeping everyone cool with a backyard water party is never a bad idea during the hot months of summer! The options listed below might actually incorporate items you already have in your garage, which is always a plus! 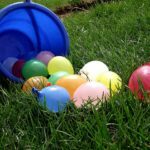 Water balloon fight: Fill a big tub with water balloons, and let the kids go to town in the backyard! The fun will be worth the cleanup. Sprinkler fun: Turn on all of your sprinklers, and tell the kids to suit up! This always makes for an endless amount of fun! Homemade slip-n-slide: If you have a tarp, lay it out across the backyard. Spray it down with a hose, and don’t forget to leave the hose running for that constant slip-n-slide effect. The kids will have a blast slipping and sliding their way across the yard! If you don’t have a tarp, no need to worry. Plastic sheeting from the hardware store also works perfectly! DIY ice cream bar: Set up a topping buffet, and let your little guests make their own sundaes! Water gun painting: Fill water guns with paint, and set up easels with paper in the backyard. Let the kids make their own colorful creations by squirting paint from the water guns! Bubbles: Let’s be real. What outdoor party is complete without bubbles? Before we leave you to backyard bash preparation, it’s important for us to note that mosquitoes feed mainly at dawn and dusk. Unfortunately, dusk is also the perfect time-of-day to be outside manning the grill and getting splashed by water balloons. Consider clearing your yard of mosquitoes with a barrier spray treatment, so that your guests can leave your party with a big smile and not a bug bite in sight. Give your local Mosquito Joe a call today to ensure that you’re on the schedule in time to have an itch-free backyard birthday! This week we’d like to introduce you to a member of the Corporate staff, Leigh Hurst. A Norfolk native, Leigh joined Mosquito Joe in March as our Administrative Assistant. She brought with her years of customer service experience from the restaurant industry and even spent some time as a yoga instructor. Whether it’s coordinating events, keeping the kitchen stocked, helping our franchise partners across the country, or just managing the office in general, Leigh is integral to the success of Mosquito Joe. Here are some fun facts about Leigh, so you can get to know her like we have! I heard of a position that was available here, came in for an interview, and thoroughly enjoyed every one I met. Plus, the office is a pretty cool space. Every day there is some thing different. Some days it is about the snacks, but most days, it is the people I get to interact with. I’ve worked in customer service since day one at my first job. I thoroughly enjoy helping others and meeting people. “Itching is so last season”…well isn’t it?! Natalie Portman, she can pull off a shaved head. The list “where I wouldn’t go” is much shorter than the list “where I would go”. The ultimate vacation is when there is no end to exploring. Bouncing from country to country exploring sights, food and building friendships while submersed in different cultures is a dream. It depends on the season! Summer is my favorite time of the year, so any and every thing outdoors. Winter out West is beyond beautiful, especially while snowboarding. Fall and Spring in the East are beautiful times to watch the change in the seasons from Mother Nature. I was born and raised in Churchland/Portsmouth, VA…by mosquitoes. 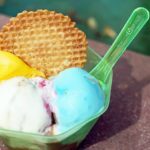 The ship, my water filter, and ice cream. Dolly Parton, Neil deGrasse Tyson, and Caitlin Cimini. Once you google who they are and watch about 30 seconds of them speaking, you would want them at the party too! Get Your Play On This July! Aside from Independence Day and debilitating heat, July is also Park and Recreation Month! Promoted by the National Recreation and Park Association, this month is dedicated to encouraging people to embrace outdoor activities and experience their local parks system. It’s a time for us to recognize the importance of physical health and the pivotal role that outdoor adventuring plays in our wellbeing. Whether it’s a kickball league, hiking trail, or nature class, you can find the perfect way to celebrate this month in your local parks! If you’re having trouble figuring out a place to start, here are a few ideas to start getting that body moving! Find some local nature trails and explore. Discovering new places to become one with nature is never boring. Bring your bikes or pups along for added fun! Look in your area for an outdoor fitness class. Many communities offer sessions like yoga or interval training at a local park. Go swimming. Whether you’re taking a dip in a lake or just going for a casual swim in the community pool, this is the best way to cool off and stay active at the same time. Collect cool rocks or seashells. Live near a beach? Take a long walk, and keep your eyes open for shelf-worthy items. Make a game out of it, and the kids will have a blast. Have a picnic. Go out to a local park and bring a blanket, food, and a frisbee (or any toy of your choice). Enjoy your picnic, and spend the day in the sun. Take your dog to a dog park and release all of that pent-up energy! This is an easy way to mix things up from the normal walk around the block, and Fido can make some new friends! Engage the rest of your community in what you’re doing to celebrate Park and Recreation Month by posting your pictures of your adventures on social media using the hashtag #PlayOnJuly. If you own a small business closely associated with the outdoor recreation industry, there are plenty of ways for you to get involved in the month as well! Visit the National Recreation and Park Association’s website for a comprehensive toolkit to help you promote staying active and visiting the local parks. Print the Park and Recreation Month poster and hang it around the community at community events, inside your facilities, and anywhere else that will stand out. Download the social media and press release templates and fill them in to make your community aware of Park and Recreation Month. Post the infographic on social media with the hashtag #PlayOnJuly. Download the customizable calendar to fill in all of your outdoor events and post on your website and social media. This is the best time of year to be outside, so get out there and enjoy it while you can! Enjoying the outdoors is a great way to stay active, learn more about your community, and spend quality time with family and friends. If you come back from your park adventures and want to enjoy the outdoor space at your own home, give your local Mosquito Joe a call to make sure you spend more time playing and less time swatting. Mosquito Joe rids your yard of mosquitoes, fleas, and ticks, making outside fun again for you and your family. Happy Park and Recreation Month from our family to yours!